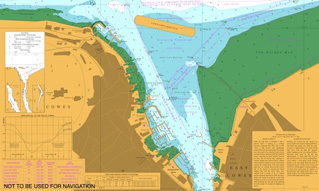 Sailing and racing are words that are synonymous with Cowes and this reputation is largely based on the activities of the various sailing and yacht clubs that have bases in Cowes and East Cowes. Founded in 1815, the Royal Yacht Squadron (RYS) is one of the oldest and most prestigious yacht clubs in the world and celebrated its Bicentenary with a spectacular series of regattas in 2015. The home of the RYS is the iconic Cowes Castle, which was built in 1539 as part of Henry VIII’s chain of coastal defences. Today, the cannon in front of the Castle signal the start of races, rather than approaching invaders. In front of the Castle, at the western end of The Parade near The Green, is a spectacular spot to watch the starts during Cowes Week and other major events. The RYS has an active racing and cruising programme and Royal Yacht Squadron Racing Ltd is the challenging club behind the British America’s Cup bid, Land Rover BAR, headed up by Sir Ben Ainslie in the 35th America's Cup in Bermuda in June 2017. The Royal Ocean Racing Club (RORC) was founded in 1925 in Plymouth following the very first Fastnet race. It is a national authority for the measurement and rating of offshore yachts, and is involved in the organisation of offshore events around the world. The RORC hosts a busy schedule of both inshore regattas in the Solent and cross-channel races, including the Vice Admiral’s Cup in May and the Rolex Fastnet Race in August. In Cowes, the RORC maintains two locations: the RORC Cowes Clubhouse and the Disrespect in which the RORC Race Team are based. The RORC Cowes Clubhouse is located at the water’s edge at the end of the Parade. The Cowes Clubhouse grounds possess unrivalled sea views over the Solent, and provide a perfect spot to have lunch and watch the days sailing. The Clubhouse is renowned for hosting a variety of social events throughout the year, for members, visiting yachtsmen and guests. The Clubhouse also has twelve bedrooms; four with en-suite facilities and a further eight well-appointed bedrooms with adjacent bath or shower rooms. The Royal London YC (RLYC) is limited to just 500 members, but has a busy calendar of both racing and social events. Originally founded in London in 1838, the club’s home is an elegant pair of Regency houses on The Parade in Cowes, with some of the finest views across the Solent. 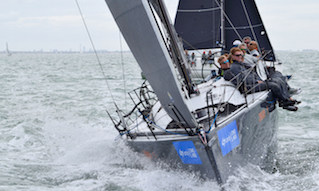 The club hosts the popular Charles Stanley Direct Cowes Classics Week for Metre classes, dayboats, classic yachts, old gaffers and Spirit of Tradition yachts, which is now in its tenth year, organised in association with many of the clubs in Cowes. In 2017, the Club will host the Flying Fifteen Southern Area Championships in July celebrating 70 years of Uffa Fox's famous design, and a special 70th Anniversary Race on Monday 17 July, plus a number of Etchells championship regattas including the new two-part autumn series. Throughout the year, the club also offers members excellent facilities, accommodation and catering. One of the biggest and busiest clubs in Britain and with over 2,300 members the largest club on the Isle of Wight, the Island Sailing Club (ISC) has a packed sailing programme, with racing both at weekends and mid-week. The ISC is the organising club of the world famous Round the Island Race, which regularly attracts upwards of 1,500 boats in a spectacular race around the Isle of Wight. This year it takes place on 1 July. The club is also hosting the Dragon South Coast Championship and 69 years after hosting the first International Edinburgh Cup is delighted to be hosting it again! Additionally the club is running an Island Businesses Sonar Regatta (open to all member and non-member IW businesses) as well as the City Livery YC Lord Mayors Cup Regatta and HMRC Regatta to name just a few! The ISC is home to a fleet of nine Sonar keelboats which can be hired, and the club has its own landing pontoon for members which is conveniently located opposite the Cowes dayboat moorings. Cowes Corinthian Yacht Club (CCYC) is an informal and friendly club, found off Birmingham Road and just south of the harbour entrance. 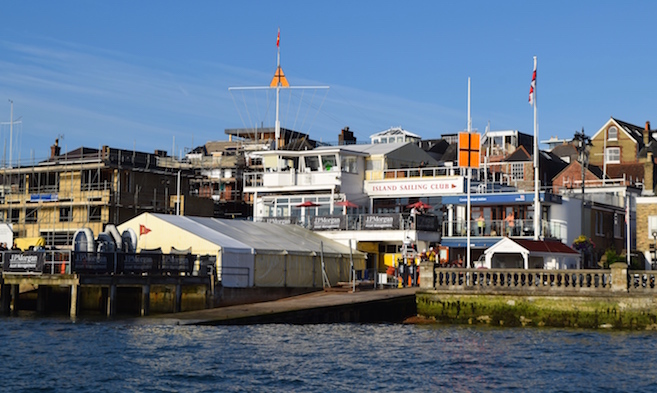 It is the only club in Cowes with its own marina berths and dry storage facilities for members (visitors are welcome, and can stay for free for up to three hours ‘so long as they buy a drink in the bar!’). It organises racing for Dragons, Darings, Etchells, Sonars, XODs and Flying Fifteens. Founded in 1952 by the late Tiny Mitchell as a club for local sailors, it prides itself on a ‘self help’ philosophy, with members assisting with launching, maintenance, and running the club. The CCYC is also home to Cowes Sailability Club who provide activities on the water for people with disabilities. Founded over 240 years ago, the Royal Thames Yacht Club (RTYC) is the oldest continuously operating yacht club in the world. The London clubhouse has a superb position at 60 Knightsbridge, with views over Hyde Park. Facilities include members’ accommodation and a fine dining restaurant. 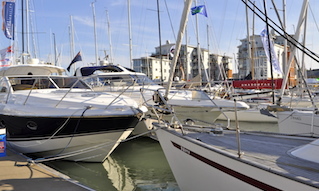 In Cowes, the Royal Thames operates primarily from Shepards Wharf Marina where the club's J/70 fleet is based. RTYC organises keelboat racing and cruising events, and has an active younger members racing division. East Cowes Sailing Club (ECSC) runs popular Thursday evening racing throughout the season, with a start and finish line off the Shrape. It caters to dinghy and handicap cruisers, with racing in both spinnaker and non-spinnaker divisions. The clubhouse is located behind the Victoria Tavern pub on Clarence Road in East Cowes. Membership fees are kept low. The club has a river frontage with storage sheds, while on the water, there are a number of small boat moorings, a walk-ashore pontoon with finger berths and a deep-water visitors’ berth. There is also a dinghy park in East Cowes, but no bar facilities. Gurnard Sailing Club (GSC) is the Island’s premier dinghy club, and hosts the popular Cowes Dinghy Week. It has a full sailing, social and training calendar, with coaching for both adults and youths. It is a friendly club, which caters for both beginners and competitive sailors, and has a lively social calendar. 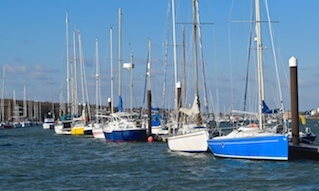 Based in Gurnard Bay, a mile or so west of Cowes, the sailing waters include strong tides, a rocky shore and challenging conditions, making for first-class sailing. 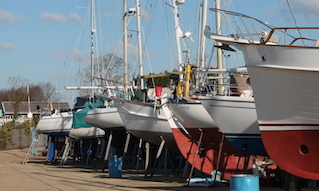 The club has dinghy parking for members, and extra space on Gurnard Green for visiting dinghies. Photo: Island Sailing Club, Cowes.